Discover the new 2-channel DJ Mixer DIF-M2 from professional supplier DJ Tech. Thanks to extensive improvements to its predecessor, the DJ mixer has become even more professional. 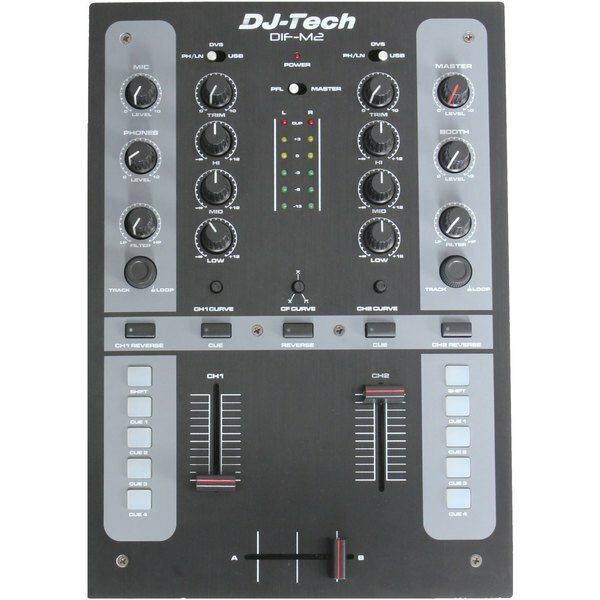 The firmware has been completely redeveloped by DJ Tech and runs even more stable. Thanks to modifications, the housing no longer needs to be opened to calibrate the crossfader. The equalizer is now equipped with real analog circuits, which significantly enhances the sound and makes a complete cutoff possible. For enhanced connectivity, the DIF-M2 DJ mixer is equipped with a USB slot with audio interface. So you can simply connect the mixer to your PC and record your sessions quickly and easily. Customer ratings for "DJ-Tech DIF-M2"
Hello everyone! I took this mixer about 1 month ago and yes, IT'S WORKING! Very good crossfader and not so cheap linefaders as previsions model 1M. Perfect work with SSL and not so good with Traktor, can't remapping at all midi buttons. Nails feel bad after top of the mixer but few stickers make scratching better. Very good mixer for novice.